Henry David Thoreau said it, and he meant it, as he took off to live in an isolated cabin in the woods with barely any earthly possessions. Now, nearly 200 years later, it still holds true. Even in this time of unlimited choices and advanced technology, the simplest answer is usually the best one for us. The simplest foods tend to be the healthiest, the simplest drinks tend to be the purest, the simplest medicines (herbs, nature) tend to be the most healing and least damaging, the simplest toys encourage more creativity, and the simplest lifestyles tend to be the most fulfilling. One of the places where I like to encourage beginning simplification is the home. I work with so many Mom’s that feel overwhelmed with day to day life, and keeping up with the breakneck pace that their entire family is committed to. Life is busy, but when your home is busy too you can find yourself in constant overwhelm. 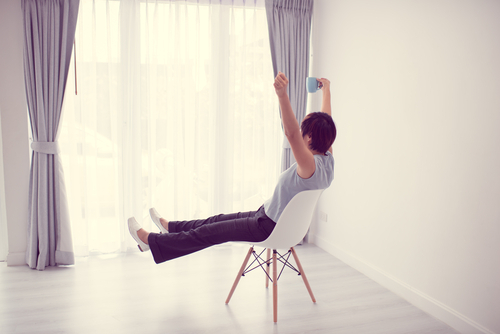 Tackling your home gives a very visual sense of accomplishment and allows you to drop your shoulders and breathe fully. When your home is organized and uncluttered, it actually drastically reduces your “to do” list. You don’t have to spend as much time managing your belongings, you can dedicate your time to things that are more important to you such as family time, and you still have everything you need. Accomplishing this actually reduces your “there’s not enough hours in the day” feelings. It creates a less over-stimulating environment for your children, and can actually improve their attention and focus. Not to mention, there is more family harmony when everyone feels at ease in their home sanctuary. Sounds great and so simple, so what’s the catch? Personally, I believe that clutter and crap have the same reproductive lifecycle as fleas, lice, and cockroaches. They’re always in abundance no matter how much we don’t want them. Every time I clear out my home, I seem to get an influx of well-meaning friends wanting to “hand down” their children’s toys, or the next holiday arrives and fills things up again. It’s especially challenging if you develop sentimental attachments to things (ahem). So, how do we go about this? After many years working at this assignment, here are my recommendations. You are more likely to be successful if you tackle small projects. It’s less overwhelming, and once completed you will be inspired and motivated to continue the work. I once did a drastic clean out of my clothes closet. After parting with 4 lawn and leaf bags (and this came from a small closet), I felt great. Getting ready every morning was quicker, putting laundry away was quicker, and I just felt at ease every time I approached my closet instead of tense. It gave me a huge push to tackle the next area of my home. If you have one area of your home that you know is really tough for you to clear out, do it last. Completing easier projects will give you a sense of accomplishment, and enjoying what you have done already will give you the momentum to clear out your toughest area. For me, clearing out the kid’s toys is the most difficult. I think I feel bad making those decisions for them, and am actually quite grateful that now my daughter is able to do it for herself. It actually took some training for her to be able to clear her space well after years of her Mom not being so great at it. She also feels amazing once it’s completed, and stops avoiding her room. Moving clutter from a closet to the shed or storage is not clearing it out. If there is no way you are ever going to host that yard sale; then get it out. If there is no way you will ever get around to putting it on Craigslist; then get rid of it. If you want to make some money from your clothing and possessions, look for local consignment shops. Also, there are some really worthwhile donation centers such as women’s shelters in every community that can make you feel good about passing things on. As I mentioned before, clutter reproduces quickly and silently. You can be living your happy life when all of a sudden you feel it weighing down on you again, eek! The good news is usually you get so used to enjoying your clear space, that it takes much less clutter to jump start you again. Re-imagine your space with simple, clean, family-friendly design projects to really feel good about all your hard work. And, don’t feel like you have to get rid of everything you love just because it’s not functional. Hold on to your favorite mementos as part of your design, and they will stand out more now that they aren’t hidden behind so much other stuff. Enjoy your space, your family, and your life!